Next review Empire Today - POOR INSTALLS DONE BY EMPIRE BY FOREIGNERS!!!! 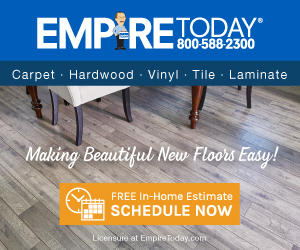 Empire Today - Do not use EMPIRE! Over priced! Completely dissatisfied!!! Paid too much compared to competitor pricing. The sales rep- guaranteed that this was the best price that was out there. What a lie!!! Other companies charge almost $3,000 less!! Then they won't match OR take care of you in anyway. They did however call me back when they stated they would but it was for nothing. They wouldn't give me a detailed bill with included the individual breakdown of laminate per square foot, sub-floor, labor, etc... They stated that they only dealt with package rates! Corporate office pretty much said that there is nothing they can do! Don’t use them!!! Complete rip-off!!! Review #122148 is a subjective opinion of avt9988. I worked at Home Depot and Lowe's. Prices at ET are higher due to unique approach of installing carpet next day. HD and Low'es only have 5-10 mostly ugly brown carpets in-stock. Installation beginns no sooner than 1 month after you pay for install.